There are several different reflow methods to liquefy solder in a controlled way and not all of them can literally be called “ovens”. Convection: Boards with their assembled components are passed through heated, circulating air from a conventional electrical heat source. Infrared (IR): Boards are passed inside a chamber over a direct IR heat source. Vapor Phase: Vapor is generated by heating a fluid with a specific boiling point (240° C) and transfers heat to the circuit board just above the melting point of the solder. Check out DDM Novastar's wide range of Reflow Oven Machines. Have questions or need help specifying a machine? Use our contact form for assistance. Q. What size do I need? A. How many zones can you afford? Seems like an odd way to start a discussion about Reflow Ovens, but it’s not entirely unreasonable. As with any complex process, there will be tradeoffs between cost and capabilities, and more zones will always give you better flexibility and more control over your profile, but at a cost. The decision has to be qualified primarily on your anticipated throughput, that is, how many boards you process in a day or a week. **In a typical low-to mid-volume production world, a small conveyorized horizontal convection oven meets most basic requirements. Now for the explanation. A typical soldering operation in today’s world requires three main stages for temperature profiling: Preheat, Soak, and Reflow to perform these functions: 1) The preheat stage for a certain period of time to activation temperature, 2) the soak stage for a different period of time to activate the solder, and 3) the reflow stage where temperatures peak for yet a different time frame. After this, the board is typically cooled and removed. Depending on the material, e.g., leaded, lead-free or specialty materials such as epoxies, the heating profile for each stage will vary according to the manufacturer’s specifications to achieve optimal bonding. With a hot plate (a direct contact device), it is nearly impossible to achieve three discrete stages with any degree of accuracy, so this technique is recommended only for the hobbyist who makes a couple boards a day and isn’t particular about the thermal profile. A dual-stage hot plate can do a little better, because with two digital temperature controls, the user can pre-set temperatures and manually move the board from one plate to another for specific times to accomplish each stage. However, no hot plate is really a technically professional method. Single zone batch ovens can improve quality and speed by virtue of a built-in multi-stage temperature controller. This system is appropriate for the serious hobbyist, budget-conscious customer, or test lab. It works by pre-setting the temperatures for each stage, placing the board in the oven, closing the lid, and removing it when complete. Adding a single or multi-device shuttle helps to stage one board for loading as soon as the prior board is done and eliminating the need to open the lid. Obviously, this technique is limited by speed but also by size, since batch ovens typically handle boards only up to 8” x 8”. starting with three zones to achieve each stage of preheat, soak and reflow, are the best solution for any type of production volume. They provide complete control of each stage for temperature and timing. Moving via a constant speed conveyor, each board spends just the right amount of time in each stage based on the zone length (or alternately, the number of zones), to achieve the perfect ramp temperature rate for the material profile, board density and geometry. Pros: Economical production system for >100 boards/day; will typically accommodate board sizes up to 12”x12”; offers precise control of ramp temperatures to handle most common leaded and lead-free soldering profiles; can be reconfigured easily to run different board profiles, an important feature for contract manufacturers. Now back to the original question: Why is it always a good idea to buy as many zones as you can afford? Or rather, when might you need more than three zones in an oven? The answer is a function of how much flexibility you need in your assembly operation, and that’s driven by controllability, volume efficiency, and cost. More zones, along with more length will provide greater flexibility to handle more complex profiles, greater board component densities, and higher speeds (number of boards processed). As a general rule of thumb, ramp temperatures must not exceed 2 to 4 C per second for proper profiling, so more zone flexibility will provide better control. Larger ovens can also be built with other features such as the ability to handle larger board geometries and special capabilities such as double-sided soldering. For the contract assembly operator who handles a wide variety of products, more zones provides the ability to capture more business that can’t be done by competitors with smaller ovens. Regardless of the technology used for heating boards, the primary objective is to control the thermal profile to prevent undesirable conditions – such as: 1) Tombstoning (a condition that causes the component to stand up due to micro-explosions in the solder); 2) De-lamination of the substrate (a partial separation of the layers of circuit board material, similar to blisters); and 3) Poor adhesion/contact caused by over-heating and under-heating. 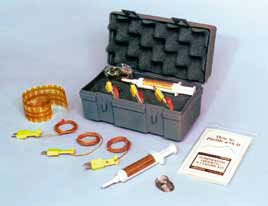 Vapor phase is a simple and reliable method of soldering. Complex components and assemblies can be done in a small process window, but this comes at a cost, so understand the process and what is involved before making a purchase decision. Vapor phase heating is performed in a batch process using a special liquid with a very particular vaporization temperature of 240F, ensuring that materials are never overheated and damaged. Parts are placed in a single chamber above a liquid bath, which is then heated to create a vapor at the perfect melting point of solder. 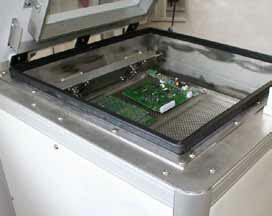 The board is enveloped in the vapor to accomplish the soak and reflow over time, and the chamber temperature is reduced to condense the vapor back into the liquid bath. The parts are then removed and replaced with a new board (or set of boards). Galden®, a proprietary heat transfer liquid from Solvay, is the most popular material typically used in these processes, and is quite expensive, although most of the material condenses back into the bath at the end of a heating cycle, so it can last quite a while. Vapor phase is a very predictable method of heating, but because it is a very expensive system, it is more appropriate for extremely high-end precision applications such as MIL-spec electronics. Pros: Very precise temperature control; eliminates the need for a profile based on product mass or size; less overall programming required since a single recipe fits all. Cons: Very high cost, up to $100,000 versus a comparable convection oven at $15,000; material very expensive; typically batch process only with slow cycle times (10-20 min/cycle versus 4-5 minutes for convection). IR systems were widely used throughout the 1990s because they were relatively inexpensive to buy and operate. IR heating can be used in either batch or continuous conveyorized units. While still available for specialized applications, IR heating is affected by the color of the target components, so different colored components absorb heat at different rates and can produce different heating profiles, not entirely desirable. Today, IR heating is often used for special applications where heat ramp rates need to go quickly with very little soak time. The direct heating technique of IR makes modulation and control very difficult. Factors that can be used to vary the heating profile include distance, speed and heat intensity. 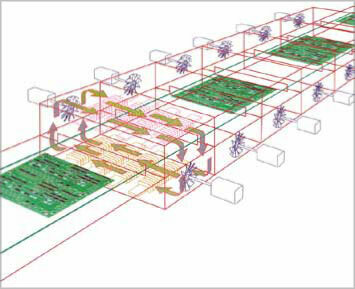 For these reasons, IR is not often used in low- to medium-volume production environments which need to accommodate a wide range of board configurations and heat profiles. Pros: Appropriate for specific applications requiring direct heating, but no longer widely used in circuit board assembly. Cons: Very unforgiving heat; boards may be easily damaged by overheating, delaminating, tombstoning, etc. ; heat profiles difficult to set based on material type and color; trials are usually necessary, making it impractical for short runs. 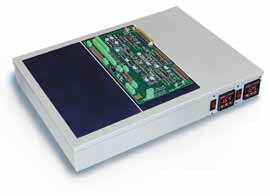 Convection heating is the most widely used method for reflowing circuit boards today. In this system, air is circulated throughout one or more chambers (or zones), either vertically or horizontally, to surround the entire board assembly with even, uniform heat. Each zone in a multi-zone oven retains its own heat profile very reliably. Both the vertical and horizontal methods of heat distribution share the same end result – even heat around the boards. A plenum heat distribution system typically directs air vertically from above and below toward the board surfaces. They often require preheating plenums to condition the air temperature before heating the board, but directing airflow from two different directions (top & bottom) allows the user to adjust heat settings independently and with good control to create a very precise profile. This type of system is usually more complicated to build and thus more expensive than a horizontal convection type. In a horizontal convection chamber, heat is uniformly distributed throughout the entire chamber, resulting in even heat distribution around the board itself. The length of each zone and the conveyor speed determine the amount of time a board resides in a particular heating environment, ensuring very reliable and repeatable processing quality. As opposed to air circulation moving vertically above and below the board, in horizontal reflows the air is circulated in one direction across the top of the board, and in the opposite direction beneath the board. This is a key benefit that prevents hot spots, and allows the parallel airstream ‘angle of attack’ to infiltrate the spaces beneath the components. Pros: Even heat distribution, as the top & bottom of the board receive the air from the outside to the center – which counters the common ‘center hot spotting’ sometimes present in traditional reflow ovens; individual zone temperatures are extremely close to product board temperatures, making it easier to profile. Lower overall equipment cost, since a plenum is not required. A conveyorized mesh belt, typically stainless steel or other non-corrosive alloy, is the most common method. Air is able to flow through the belt for even heating on the top and bottom of the board. The pin or edge-type conveyor carries the board by the edges in a continuous line, allowing unobstructed airflow around the board. This method can be integrated within a modular in-line system with other assembly machines. Either method works equally well for single- or double-sided boards. Edge conveyors can add some cost that may not be necessary. For integration with other in-line systems, consult SMEMA (Surface Mount Equipment Manufacturers Association), which writes connection standards for modular circuit board assembly integration. If an inerting system is advised for a specific product application, Nitrogen is the most common gas used for reducing or eliminating oxidation during reflow. However, in most low- to medium-volume assembly environments, inerting is typically not needed. When specified, an inerting system can add approximately 10% more to the cost of a basic reflow oven, and most manufacturers offer it. Any reflow oven, regardless of the type and number of heating zones, needs a method to control the temperature and recipe profile of the product being processed. These can either be built-in to the oven (i.e., on-board) or PC-based and connected via a communications cable. As with everything else, there are advantages and disadvantages to each type. On-board control means that the oven has a stand-alone controller built in to the system. It requires no PC or external source of information to create recipes to run the process. It can be controlled via a simple user interface displaying input prompts and readouts. In most cases, the interface is fairly basic and generally rather small. Pros: Very good functional performance; generally more affordable than external PC-based system. Cons: Some restrictions in storage capacities for recipes; software updates can be more limiting due to the machine’s limited hardware capacity; user interface is typically minimal, displaying the bare essentials of inputs and outputs. Pros: Software updates are more frequent, allowing on-going usability enhancements offered by the manufacturer; A PC interface delivers a full screen color graphical user interface for feature-rich visual presentation of data; user can see profile graphs not available on most on-board systems. Users can purchase their own computers with all the capacity they may need now and in the future to accommodate a much greater number of recipes/profiles than would be available on an on-board system. Cons: Can add $500 - $1000 in cost versus an on-board control system. The product profiling process determines and/or validates the actual oven settings in the controller, regardless of whether it’s on-board or PC-driven. Profiling kits are available from most manufacturers and include thermocouples, all accessories to attach the probes to the board for use during the process, and a how-to guide with instructions. Profiling is done using one or more thermal probes (thermocouples) attached to the product and running it through the entire process to validate or modify a recipe based on the solder past or product requirements. Multiple probes are desirable for profiling to ensure that the board surface temperatures from one side to the other don’t vary more than 2-4 C.
An optimal reflow profile is one of the most critical factors in achieving quality solder joints on a printed circuit board (PCB) assembly with surface mount components. 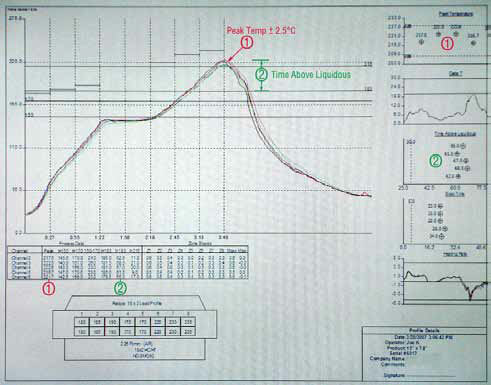 A profile is a function of temperatures applied to the assembly over time. When graphed, a curve is formed that represents the temperature at a specific point on the PCB, at any given time, throughout the reflow process. Profiling can be done with some on-board control systems; however, they are limited in visual representation by size and configuration of the display, and they usually don’t have a utility to print or save and retrieve a file off-line, which is necessary for ISO 9000 and other quality assurance documentation. So, if you are considering an on-board control, make sure it has the option available to export/output data for QA documentation if you think you will need it in the future. A PC-driven profiler will provide a feature-rich user interface to enhance the operator’s use. The Windows™ operating system is familiar to everyone, and is very intuitive for graphical presentations, seamless printing and file saving functions to ensure proper record-keeping. three are heating and the last is cooling. When evaluating proposals from reflow oven vendors, try to find references or reviews before you buy. You can often find them on Internet search, and while not altogether scientific, you may get some clues regarding construction quality or temperature stability that could influence your decision. Some offshore products may look attractive from a pricing perspective, but may not perform to your standards; plus, aftermarket support can be problematic if you need help. Click here to contact DDM Novastar for information on Reflow Ovens or other machines. Download the PDF: "Selecting a Reflow Oven"